After the American Civil War, rootless American soldiers of fortune are drawn southward into Mexico, where the Mexicans led by Benito Juarez are rebelling against the Austrian-French regime of the emperor Maximilian. 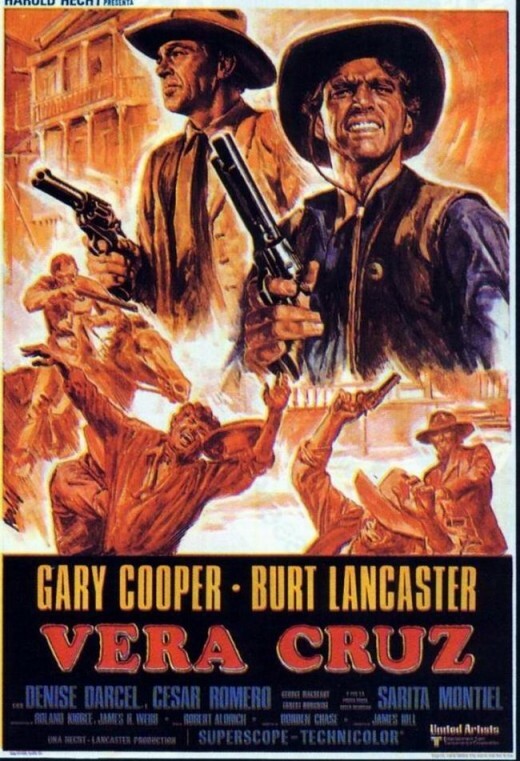 Among these mercenaries are the two protagonists of this film: Joe Erin, a flashy, grinning gunfighter of dubious morality (Burt Lancaster) and an impoverished plantation owner from Louisiana who had fought for the Confederacy, Ben Trane (Gary Cooper). At the beginning of the film, Trane’s horse breaks a leg. As he tries to find a replacement he encounters Joe Erin, who sells him a horse for an exorbitant $100 in gold. He has stolen the horse from a platoon of lancers, who show up and chase the two as they make their escape. 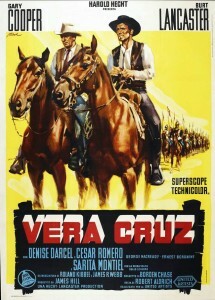 During the chase, Trane makes one of those shots so common in the 1950s, in which, shooting over one shoulder while his horse is rearing, he shoots a gun out of the hand of the captain of the lancers. Wildly improbable, this establishes Trane’s skill with a gun, however. Erin seems to have heard of him. As Trane is knocked off his horse by a shot, Erin leaps to loot the body, but Trane re-awakens and takes Erin’s horse and saddle instead. 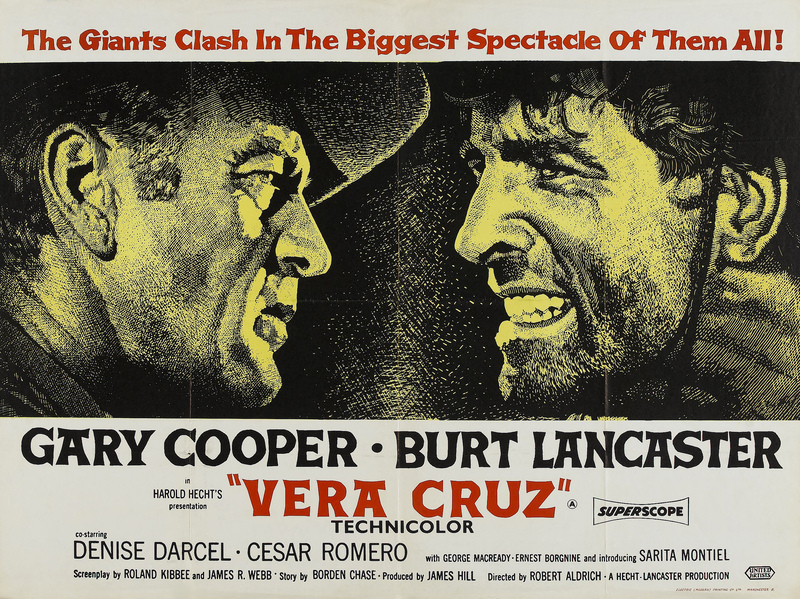 Lancaster, flashing his pearly whites, as he does for much of the movie; and Cooper, with his unflinching rectitude. The collaborations and collisions between these two provide most of the tension in the film. In the next town, Trane encounters a rough band of Americans in a cantina, who assume that he has killed Erin to take his flashy horse and rig. As they set upon him and are about to kill him, Erin shows up, demonstrates that he’s not dead, and they all head off to meet with the Juarista general to see how much he’ll pay them. As they enter another town, they see another rough band of Americans tormenting young maidens. Trane rescues one of them, the fiery Nina (Sarita Montiel), who kisses him and steals his wallet. Erin takes over the new band of Americans, adding them to his own unsavory gang. Trane unconvincingly romances the fiery Nina (Sarita Montiel). 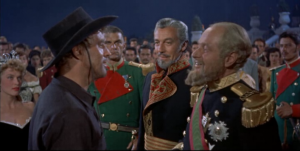 The first potential employer they encounter is not the Juarista general but Maximilian’s general, Marquis Henri de Labordere (played by the smilingly cosmopolitan Cesar Romero). He recruits them for a mission for Maximilian and is willing to promise more than the Juaristas can pay. However, all of them are trapped in the town square by the Juarista forces until Erin and Trane engineer a way out by using children as hostages. The Juarista general mouths a number of honest-sounding revolutionary platitudes, so we know now which party has the moral high ground in this struggle. Arriving in Mexico City, the crude-mannered Americans attend a magnificent soiree at Chapultepec Palace, where they meet Maximilian (George Macready), give a demonstration of marksmanship and weaponry, and negotiate a mission for $50,000. They are to conduct the French countess Marie Duvarre (Denise Darcel) to Vera Cruz on the Mexican coast of the Gulf of Mexico, where she will catch a ship for France. In an aside between Henri and Maximilian, it is clear they do not expect the Americans to survive to collect their fee. From this point, everyone is trying to doublecross everyone else, with Joe Erin and increasingly Ben Trane frequently quoting Erin’s cynical mentor Ace Hanna, whom Erin killed. Joe Erin meets the Emperor Maximilian. The countess sets off for Vera Cruz, accompanied by the Americans, Henri and a troop of lancers led by Capt. Danette (German actor Henry Brandon). Various competitions are developing among the alpha males in the entourage. There is constant tension between Erin and Trane about whether they are really on the same side. They both want the countess, although they don’t trust her. Danette despises the Americans, especially Erin. Henri is playing them all. And what about the Juaristas? Erin and Trane discover the real reason for the mission: the countess’ carriage is carrying $3 million in gold, to be used to hire more mercenaries for Maximilian. She tells Erin and Trane, however, that she intends to steal the gold, and she’ll cut them in. They run into a Juarista ambush in a small town, and fight their way out with some casualties. Nina takes over a cart when the driver is shot, and joins the caravan. The countess secretly meets with a sea captain who’ll help her get away, and she makes arrangements that exclude Erin and Trane. [Spoilers follow.] Henri really doesn’t trust the countess, either, and he takes her prisoner with the intent of executing her. Erin and Trane follow the carriage, and it is attacked by Juaristas. They find the gold is gone and join the Juaristas, for a promise of $100,000. They provide covering fire for a Juarista attack on the town held by Henri and Danette, where the gold supposedly is. At great cost, the attack is successful. Erin kills Danette. With Lancaster’s trademark acrobatic agility, Erin climbs up into a third-floor room to rescue the countess. And finally, the ultimate loyalties get sorted out. Erin has demonstrated that he doesn’t have any except to himself. Trane has now decided that he supports the Juaristas. They shoot it out in classic fashion; Trane even throws away his rifle to do it with handguns. (The final showdown is very well done, with due gravity given to the ceremony of the occasion.) Trane rides off into the sunset with Nina, and apparently will get the $100,000 to rebuild his plantation, with all the rest of the unsavory Americans killed. This was produced by Lancaster’s company (with Henry Hecht), and it’s bursting with vibrant color cinematography, great locations in Mexico, a huge and talented cast, a complicated plot and ultimately even a good guy (Trane) to root for in all the doublecrossing. That’s a lot to cram into 94 minutes. 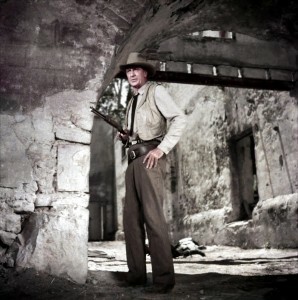 As with most of his westerns during the 1950s, Cooper seems old for his role. But Trane’s still Gary Cooper, so it works. He doesn’t sound a bit like he’s from Louisiana, nor does Lancaster sound like he’s from Texas. 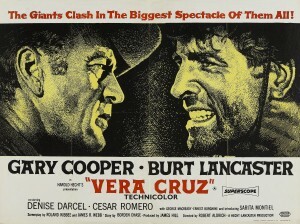 Next to Cooper’s understated acting style, Lancaster’s performance seems a bit manic here. A more experienced director would probably have helped him tone it down, if he had the clout to do so. Among the other Americans, Ernest Borgnine stands out as Donnegan, about the same time as he was playing effective bad guys in movies like Johnny Guitar and sort-of-good guys in films like The Badlanders. 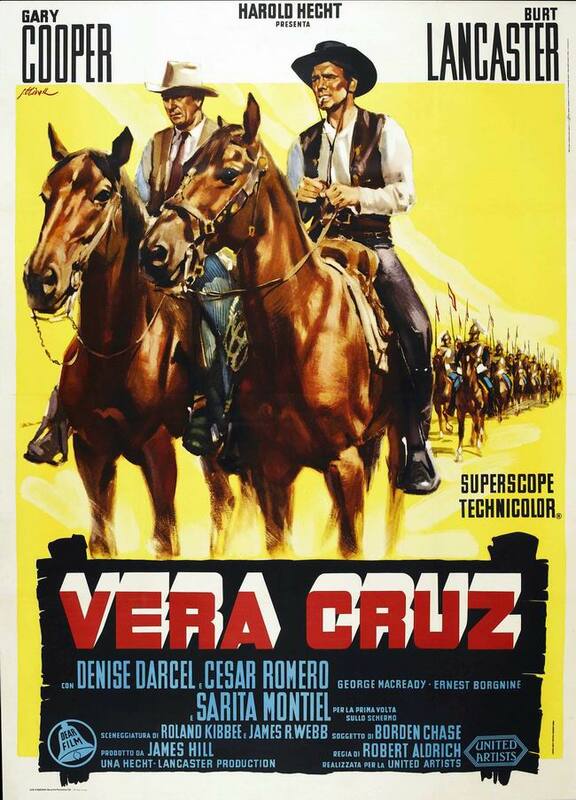 This is the second of Denise Darcel’s two westerns. She’s better in the other, Westward the Women. She and Sarita Montiel, who is fine here but has no chemistry with the much older Cooper, did not appear to have much in the way of American film careers after this. Cesar Romero, whose smilingly corrupt Marquis is sometimes referred to by the other characters as “Old Crocodile Teeth,” has his second most prominent role in a western after playing Doc Holliday in 1939’s Frontier Marshal. It is a close contest whether his teeth or Lancaster’s are more in evidence in this film; Lancaster probably wins that one. Henry Brandon, Capt. Danette here, shows up as Indians in other westerns: Comanche chief Scar in The Searchers, and a Sioux in The Last Frontier and as Comanche Quanah Parker in Two Rode Together. Charles Bronson, in the days when he was playing Indians and heavies at the start of his career, plays the crass Pittsburgh, under his real name, Charles Buchinsky. Jack Elam’s here, too, although he doesn’t get to do much. George Macready as Maximilian was 54, twenty years older than the real Maximilian was at the time of his death. Aside from the individual performances, the direction of the larger-scale action scenes is good. 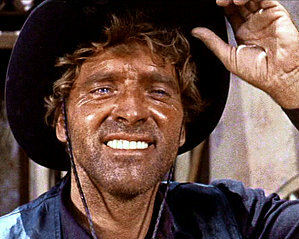 The script isn’t great; in a short movie we hear way too many quotes about Ace Hanna, who’s dead long before it begins. The music by Hugo Friedhofer is very good. The story is by experienced western writer Borden Chase. 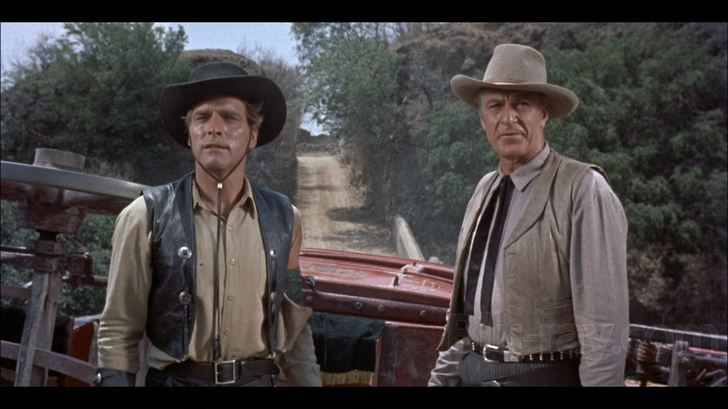 The use of not-completely-bad and not-entirely-good characters in westerns was innovative for its time. It is said to have strongly influenced Sergio Leone and other makers of spaghetti westerns. The camera work sometimes (as in the scene where Erin kills Danette) makes one wonder whether they thought this might be shown in early 1950s 3D. 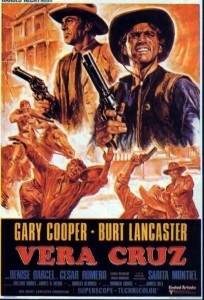 Many see Vera Cruz as one of the great westerns, but the parts don’t work together well enough for that. It is one of those rare cases where maybe the film should have been longer to help us cope with the spectacle and plot twists. It is fun to watch, however, and more than once, to try to figure out what the various characters’ real motivations and allegiances are. Dave Kehr refers to it as “Robert Aldrich’s hugely influential comic western … This cynical and exuberant film [is] the direct precursor to the disillusioned 1960s westerns of Sergio Leone and Sam Peckinpah.” It’s probably only comic in the limited sense that there are some elements that can’t be taken quite seriously, rather than in the sense that it’s played for laughs. This entry was posted in Westerns Worth Watching and tagged Adventures in Mexico, Burt Lancaster, Ernest Borgnine, Gary Cooper on February 15, 2014 by Nicholas Chennault.